Total L = 120; bell L = 62, W top = 90.7, mouth W = 51, depth = 47.8; th walls = 1.5; clapper base W = 9, th = 6.5; suspension ring diam = 72.5, W = 4.8, th = 5.5 mm [RTS 5/9/2005]. Iron bell consisting of a broad body, formed from a rectangular sheet of iron, folded double over the top, then the sides pressed together and hammered shut with applied heat to close them. These sides have been flattened, but the central part of the body has been pulled open to create a hollow almost cylindrical interior that is lentoid in plan view. The upper part of the body has been perforated with 2 small holes, punched through from one side of the bell, and fitted with a large iron suspension loop made from a rod hammered into a circle with touching ends. A smaller ring hangs from the base of this, inside the bell, and this in its turn provides a seat for the clapper. 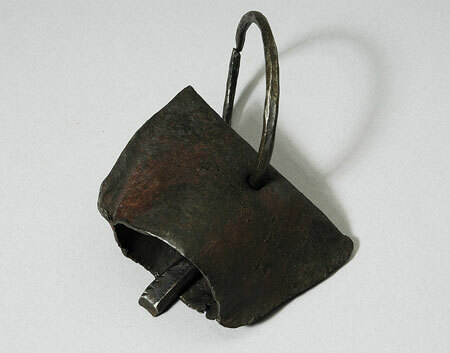 This has been made from a thick piece of iron, with tapered top that has been hooked over the small loop and pushed back against the clapper body; it has an almost rectangular section, with the corners 'shaved' and the end cut at an angle. The clapper hangs slightly below the lip of the bell, and has been decorated on front and back with a similar design, made of a row of chiselled notches down one edge, and a short row of punched dots down the other. The bell is complete; there is some cracking at the mouth, that may have been caused during its manufacture; the surface is currently a dark reddish brown colour, due to rust (Pantone Black 4C). It has a weight of 253.4 grams and a total length of 120 mm. The bell body is 62 mm long, 90.7 mm wide across the top, and 51 mm wide and 47.8 mm deep across the mouth; the walls are 1.5 mm thick. The clapper has a width of 9 mm and thickness of 6.5 mm across its base, while the suspension ring has a diameter of 72.5 mm and is 4.8 mm wide and 5.5 mm thick. This bell was used to decorate the necks of bulls or oxen. Similar bells were also used to decorate Dinka cattle (see 1934.8.14 and 1979.20.103). They also appear in other cultures, such as the Ganda and Acholi of Uganda (M. Trowell & K.P. Wachsmann, 1953, Tribal Crafts of Uganda, pl. 77I; p. 327). Evans-Pritchard, writing in 1940, commented on the scarcity of iron amongst the Nuer and the high value consequently placed on objects made from it: 'Nuer have always been poor in iron objects. Till recently they possessed very few iron spears, cherished as heirlooms, but used instead the straightened horns of antelope and buck, ebony wood, and the rib-bones of giraffe, all of which are still used to-day, though almost entirely in dances ... Iron bells ... are rare and highly prized even at the present time, and in the old days iron rings and bracelets were important pieces of property' (E.E. Evans-Pritchard, 1940, The Nuer, p. 86). Accession Book Entry [IX, p. 16] 1931 [insert, in pencil] 66 [end insert] E. EVANS-PRITCHARD , Esq. Dec. Specimens collected by himself in the EASTERN SUDAN, viz. [pencil insert, p. 18] 28 [end insert] - Iron cattle-bell, with iron clapper, NUER. Pitt Rivers Museum label - Iron cattle-bell. NUER, E. SUDAN. d.d. E. Evans Pritchard 1931 [rectangular metal-edged label, tied to object; RTS 5/9/2005]. Sparks, Rachael. "Nuer cattle bell" Southern Sudan Project (in development). 03 Jan. 2006. Pitt Rivers Museum. <http://southernsudan.prm.ox.ac.uk/details/1931.66.28/>.